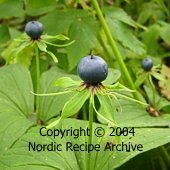 In addition to cultivated berries, there are about 50 species of wild berries growing in Finland, of which 37 are edible. Sixteen of these are picked for consumption, most importantly lingonberries, bilberries, cloudberries, raspberries, cranberries and arctic brambles. 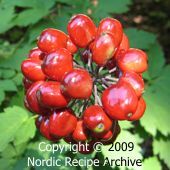 Also important are wild strawberries, bog whortleberries, mountain crowberries, sea-buckthorn berries and rowanberries, among others. 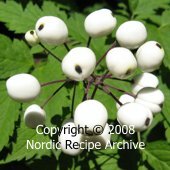 Listed below are some berries used in Finnish cooking and in the recipes of this site. Fresh strawberries are a favourite summertime dessert throughout the Nordic countries, eaten with vanilla ice cream or whipped cream. 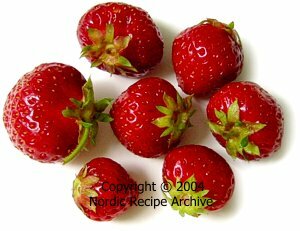 In Finland, domestic cultivated strawberries are available from early June to late August, July being the high point of the harvest time. "Rumba" and "Polka" are currently some of the sweetest and tastiest varieties of the cultivated strawberries grown in Finland. Wild strawberries, the ancestors of cultivated strawberries, may be regarded as a delicacy. 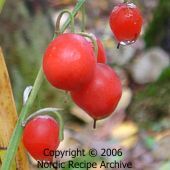 Although their occurrence in Finland has greatly diminished during the last century, they can still be found growing in the wild in various places. 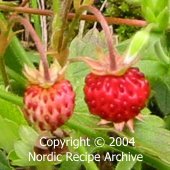 Wild strawberries are considerably smaller than cultivated strawberries (see the picture below), but their flavour is much sweeter and more intense and aromatic. When picked, they are usually just eaten fresh. 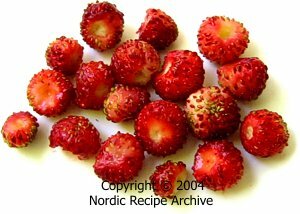 Picture on left: Finnish strawberries  small cultivated strawberry (back) and tiny wild strawberries (front). 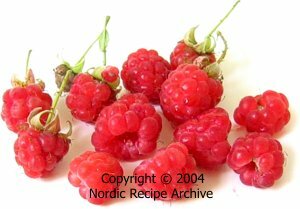 Raspberry is cultivated throughout Finland. The berries are picked from July to August. 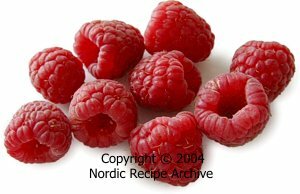 Raspberries are eaten fresh or made into jam, berry coulis, etc. Besides the red raspberry, there are also paler varieties available nowadays (yellow, white, orange, etc). 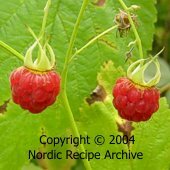 Wild raspberries can be found growing throughout Finland. They are much smaller in size than cultivated raspberries (see left). The flavour of wild raspberry is very intense, sweet and aromatic. Growing along roadsides and glades, they are usually just eaten fresh from their bushes. Bilberry is native to Europe and Asia. In Finland, it grows in the wild throughout the country. 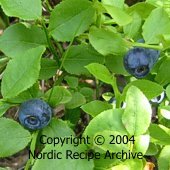 Bilberries are picked in July to August and most commonly eaten fresh or used to make pies, soups, jams, jellies and juices. The flesh of bilberries is deep purple in colour and their juice stains easily, also one's teeth, tongue and mouth after eating the berries. The flavour resembles that of the American blueberry (see right) but although slightly tarter, is much more aromatic. Blueberry is native to North America and is nowadays cultivated also in Europe. 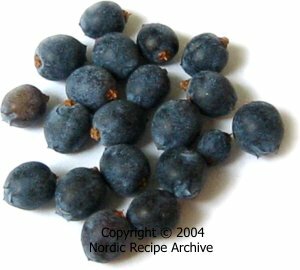 In Finland, blueberries are used much like bilberries (see left). 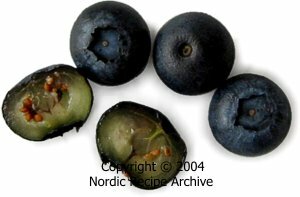 Compared to bilberry, the flavour of blueberry is very sweet but somewhat bland, lacking the complexity of flavour of the former. Blueberries are much larger in size than bilberries and their flesh is almost colourless. 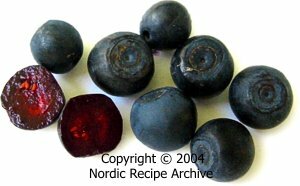 Picture above: Finnish wild bilberries (left) and Finnish cultivated blueberries (right)  notice the distinct difference in their size and colour of the flesh. 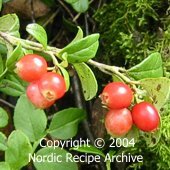 In Finland, lingonberry  also known as cowberry  mainly grows in dry peaty forests, where it is picked from July to October. Lingonberries are high in pectin and contain natural preservatives like citric and benzoic acids that protect the ripe berries from fermenting and producing of mould. Lingonberries keep well without any additives, even sugar. The ripe berries are slightly tart and juicy, the taste resembling that of wild cranberry (see right). 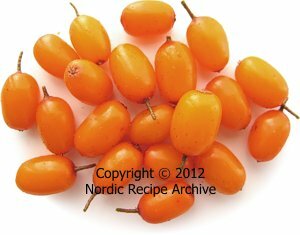 Finnish lingonberries are used to make pies, jams, jellies, soups, juices, desserts and liqueurs, among other things. They are also served fresh, mixed with sugar, to top porridges or to accompany many Scandinavian meat and game dishes. The European wild cranberry (Vaccinium oxycoccos) is smaller in size than its North American cousin (Vaccinium macrocarpon, see below). In Finland, wild cranberries are mainly found growing on bogs and marshlands. When ripe, the berries are bright red and juicy. They taste rather tart, but after being frostbitten their tartness is diminished. This is why they are usually picked very late in the autumn. 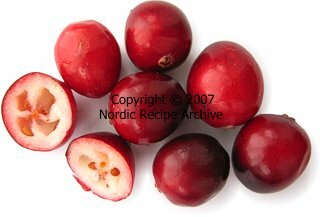 Finnish cranberries are used much like lingonberries (see left), in soups, juices, jellies, desserts, liqueurs and sweet or savoury sauces and preserves, or they are eaten as candy  see sugared cranberries. Like lingonberries, cranberries contain natural preservatives that make them keep well without any additives. They also freeze well. 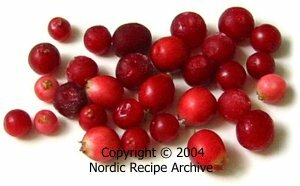 Note: in most recipes of this site using Finnish cranberries or lingonberries, the berries cannot be replaced with larger North American cultivated cranberries, which are rather dry, woody and fibrous. 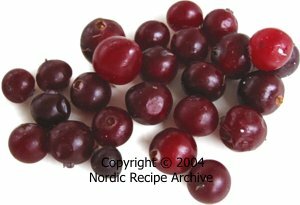 Finnish lingonberries and cranberries are picked in the wild when ripe and are much softer, juicier and tastier and suitable to be eaten fresh out of hand. Picture on right: hard and dry North American cranberries. 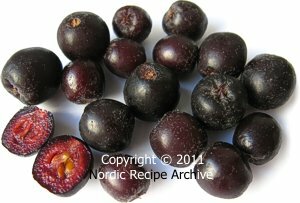 Blackcurrant is native to northern Europe. 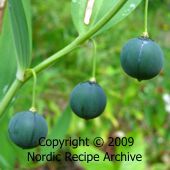 It is cultivated throughout Finland, but also grows in the wild. The juicy berry is dark, purple-black in colour and highly fragrant and aromatic. It tastes slightly sour, but much sweeter (and better) than red or white currant. 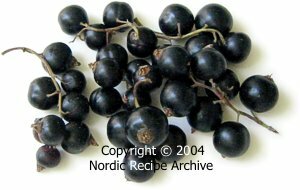 In Finland, blackcurrants are mainly used to make jellies, jams and juices, or used in various desserts. They are also eaten fresh, with sugar. The fragrant leaves are used to flavour vegetable preserves, especially pickled or salted cucumbers. Blackcurrants are high in vitamins C and B and hot blackcurrant juice is a trusted old cold remedy. Green currant is a variety of blackcurrant with translucent yellowish-green berries. Its flavour resembles that of blackcurrant, but is milder, sweeter and less acidic. 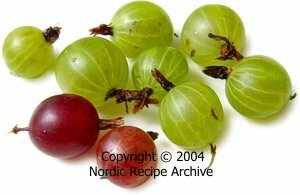 Gooseberries are not native to the Nordic countries, but are cultivated here. The berries ripen in August. Depending on the variety, gooseberries taste tart or sweet, their colour ranging from white and yellow to green and red. 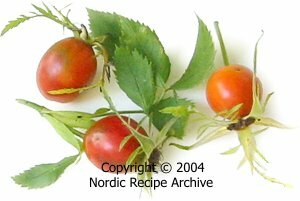 In Finland, gooseberries are used mainly to make jams, jellies, juices, wines and sweet-and-sour sauces, or just eaten fresh, with sugar if they are tart. They can also be served to accompany various fish, meat and game dishes. Note: Since the beginning of the 20th century, cultivating of currants and gooseberries has been restricted in parts of North America, because the plants act as hosts for white pine blister rust (Cronartium ribicola), a fungal disease affecting and killing white pine trees (Pinus spp.). Nowadays, new disease-resistant currant cultivars are being tested in order to be reintroduced to North America. There is only one variety of red currants that is native to Finland, namely the downy currant (Ribes spicatum). The berries of cultivated red currants are picked from July to August. The juicy, bright red berries are highly acidic and very tart. They are seldom eaten fresh or unsweetened. 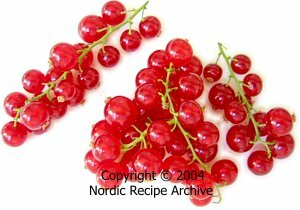 In Finland, red currant is used mainly to make jams, jellies, juices and wines. 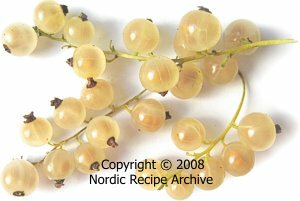 White currant (in picture above) is another variety of the common red currant. 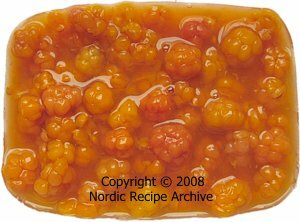 Cloudberry  also known as baked-apple berry  grows in the wild throughout Finland, being most abundant on the bogs of Lapland. Cloudberries are picked from July to August. They are high in vitamin C and are often eaten fresh with sugar and whipped cream. They are also used to make jams, purees, liqueurs, parfaits and a multitude of other desserts. The berries are reddish orange and tough when raw, and turn bright yellow-orange and soft when ripened. Their taste is slightly tart but delicious. However, when tasting cloudberries for the first time, many foreigners from outside Scandinavia do not like their unusual, sweet-and-sour taste and the numerous large seeds they contain. 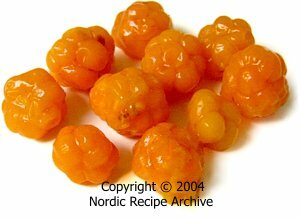 Like lingonberries and cranberries, cloudberries contain benzoic acid, a natural preservative. 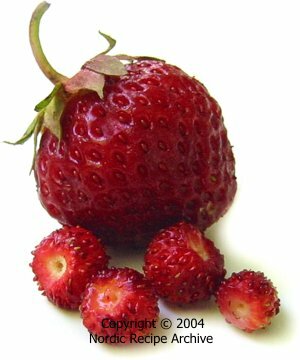 The berries keep well without any additives, covered with their own juices (see the picture above). 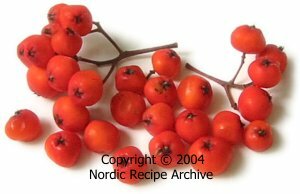 Rowanberries are the small edible "fruits" of the rowan tree. Read more about rowanberries here. Rose-hip is the edible fruit of the rose. Read more about rose-hips here. Sea-buckthorn is a thorny shrub native to Europe and Asia. 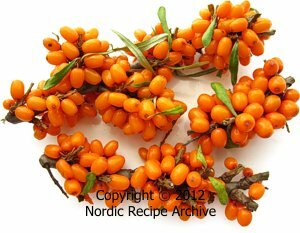 In Finland, wild sea-buckthorn is found growing along the rocky and rugged southern and westerns coasts, but is also cultivated. The fruits of sea-buckthorn are bright orange-yellow berries rich in vitamin C and carotenoids, with a strong, very acidic flavour. The berries are most often pressed into juice, which can be drunk straight or diluted with water and/or sweetened with honey or sugar. The precious juice is collected from the shrubs by using a special pressing device, crushing the berries, but leaving the branches intact and the plant unharmed. 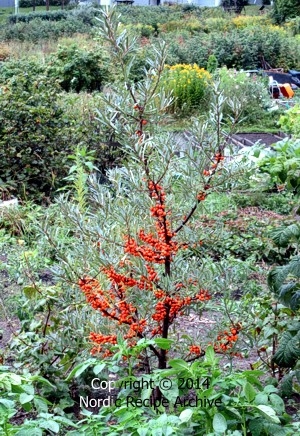 In picture above: sea-buckthorn shrub growing in a garden plot. Sea-buckthorn berries and juice are used in making beverages, liqueurs, syrups, jellies, jams, berry soups, and often in cream-based desserts like mousses, puddings, parfaits and ice creams. Besides used in sweet dishes and desserts, sea-buckthorn juice can be used in marinades for meats, game and fish, and to flavour savoury sauces, dressings and mustards. Sea-buckthorn oil extracted from the berries or their seeds contains several fatty acids, and is used in cosmetics and either internally or externally as a natural remedy to treat conditions like dermatological diseases, eye dryness, etc. Because harvesting thorny sea-buckthorn plants is very difficult, the berries, juice and oil are all rather expensive to buy. In picture above: sea-buckthorn branches with berries. 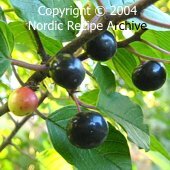 Black chokeberry (Aronia melanocarpa) is a shrub native to eastern North America, and several varieties have been developed from it in Europe. 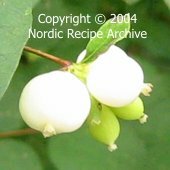 The Finnish chokeberry plants most presumably hail from Russian-bred cultivars, like Aronia mitschurinii, yielding larger and juicier berries than the native American species. In Finland, chokeberries ripen in the late summer, towards September. 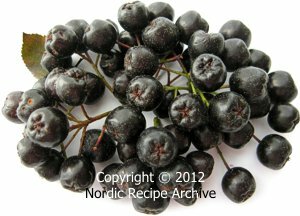 Although mainly grown as ornamental plants, chokeberries are also used in making juices, jams, jellies, liqueurs and berry wines. The berries are mouth-puckeringly high in tannin, thus usually never eaten raw. Because of this they are also often paired with other fruit or berries in cooking. The dark, purplish juice of the berries stains easily. In picture above: clusters of chokeberries. See a recipe for chokeberry jelly. 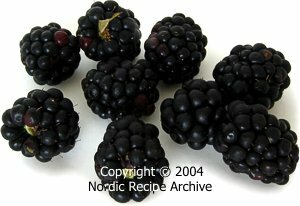 Blackberries are not native to Finland, but are cultivated and imported here. Fresh berries may be hard to find, however. 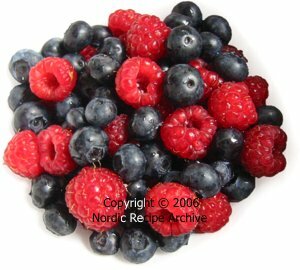 Also various blackberry and raspberry hybrids like boysenberries, loganberries and tayberries are not widely used fresh in Finland. They are more familiar here in the form of commercially made foods, like jams, ice creams, pies, desserts, etc. Juniper berry is the edible fruit of the juniper tree, mainly used as a seasoning. Read more about juniper berries here.